Welcome to the 7th edition of the Language Creation Tribune! With the days getting shorter and colder, it’s the perfect time of the year to stay at home with a cup of hot cocoa with a computer or writing pad in front of you, thinking about all these grammatical rules you want to add in your conlang, right?! These last months, the conlanging world has been dominated by the news of David Peterson’s publication of his book, The Art of Language Invention. I will not add anything to everything that has been said about this book, except that it’s really worth reading, even if you are a seasoned conlanger. Instead, I want to turn my attention towards the Language Creation Society. As you know, we finally managed to have our yearly meeting, and with it (although this year separately from it), our yearly Board and Officers’ elections. So now we start with new colleagues on the Board of Directors, and I wanted to use this space to congratulate Jamin Johnson, Jan van Steenbergen, Jim Hopkins, and Jeffrey Brown for joining the Board. I hope you’ll like it here! Also, I want to congratulate Tim Stoffel for becoming our new Secretary. Tim is going to have big shoes to fill, as Don Boozer, our previous Secretary, has done a fantastic job in that role, but I am very confident Tim will be up to the task. As for Don, although he has resigned as Secretary of the LCS, he is still a member of the Board, and I am looking forward to keeping working with him. Finally, I want to give very special thanks to Sylvia Sotomayor, who has been re-elected for another term as our Treasurer and has worked far beyond her Treasurer duties to keep the LCS running. Sylvia is truly the backbone of the LCS, and without her the whole organisation would just fall apart. So thank you, Sylvia, for spending so much of your precious free time on keeping the LCS from collapsing! When I say that Sylvia is the backbone of the LCS, I mean it. Besides her duties as Treasurer, Sylvia has been handling memberships, our entire online presence (websites, mailing lists, etc. ), the LCS Lending Library, and most of the non-local LCC organisation, along with other duties I am probably forgetting. Such a situation is unfair, both for Sylvia who ends up spending far too much of her free time handling LCS matters, and for the LCS. Sylvia will not be here to help forever, and we need to stop being so dependent on her. Luckily, we have started getting people to take over some of her current duties. John Quijada and Tony Harris have agreed to take over handling our online systems, relieving Sylvia from quite a weight. It will take some time for them to get fully up to speed, but hopefully in short order Sylvia will be able to relinquish all webmaster duties over to them. And this is what I want to talk about: as an organisation, the LCS relies entirely on volunteer work to function, and we are all only humans, with private lives and day jobs. There is only so much we can do as Board members and current officers. We do have plans, and we would love to expand our activities, but we are limited by the amount of manpower we have available. But this is where you come in. Basically, this is a call for volunteers. You don’t need to be a Board member or an officer to be able to help the LCS function. There are plenty of activities you can help with as an LCS member. Moreover, the more people we have who are willing and able to help, the more we can distribute the work load, and the less amount of work each person will have to do. For a few hours of your time per week, you can help make the LCS a much more efficient organisation, so please consider it. Our Social Media presence has been mostly underwhelming. While Don Boozer has done a great job on Twitter, our Facebook page is dormant and unmaintained, our Google+ page is rarely updated, and although we have plans for it, we still don’t have a Tumblr blog, despite that space being where most new conlangers show up nowadays. So, basically, we need volunteers to take ownership of our social media sites. We need at least three different people, each of whom will handle a single social media site (our Facebook page, our Google+ page, and our future Tumblr site). Don’t worry, we are going to automate some of the tasks related to these sites (like getting job listings from the Jobs Board, and even this very newsletter, advertised on those places), but we need people to spend some time (a few hours a week at most) to keep our social media presence up to date. Of course, we on the Board will help you get up to speed. It’s a very important job, and a good social media presence is vital to the LCS’s image, so please consider volunteering for this. Fiat Lingua, our online journal, could do with both more submissions and more editors. Please consider giving David Peterson and his team a hand. The Conlanger’s Library needs a makeover. Don Boozer is our Librarian and wants to keep working on it, but I’m sure he could do with some help. Please consider giving him a hand, especially if you have webmastering and/or database skills. This very newsletter could do with more people scouring the web to find interesting, conlang-related news, and to help Jessie Sams with the editing process. As this is a quarterly event, this requires very little time yet could be very helpful. Just think about it. These are just a few ideas. There are plenty of things the LCS does that need additional manpower. If you are interested, please contact me (or one of the people I mentioned above), and we’ll see how we can help you get started. Once again, let me reiterate this: the LCS is nothing without you, its members. We literally cannot exist without you, and your help will always be welcome. So please consider it. As I wrote, the more people volunteer their time, the less time each one will have to volunteer. There is strength in numbers! An IAL . . . On a Galactic Scale? As a fan of (well-written) sci-fi, I’ve always been intrigued by those works of the genre that discuss languages used extra-terrestrially. I’ve always wanted to see or read about space-faring explorers having to tackle the difficulty of learning alien languages, or adopting some sort of pidgin or learning the lingua-franca of the space lanes. Unfortunately, films and television usually cop out on the problem, utilizing “universal translators” or simply ignoring the problem entirely and having aliens just speak English (with a few pretty scripties shown in the background to suggest that the aliens actually have their own languages). The acclaimed author David Brin handled the issue more intelligently in his “Uplift” series of novels in which the citizens of the billions-of-years-old Galactic Empire speak a dozen official languages, labeled Gal 1, Gal 2, Gal 3, etc., each specifically tailored to the needs of different bio-forms, e.g., humanoids, avian-like beings, etc., as well as the needs of differing situations. However, no actual examples of these languages are given. the auxiliary language used most generally for communication between people of biped type. The language is designed so as to be usable by as large a number of biped type species as possible. It is the working language of the Pangalactic Community and has been so since time immemorial. It is unknown who invented the language. Artifacts of approximately a billion years old have been uncovered, with inscriptions in the pangalactic language. It seems like the language hardly underwent any change in all that time. Many proposals to set right real or perceived as have been made over the aeons, but it seems that none were ever implemented. What is sure, however, is that the language cannot have been based on any natural language, but that it has to have been constructed from whole cloth. The language comes too close to being the optimal language for interspecies communication to have more than negligible basis in any naturally evolved language. The consonant inventory is twelve in number: b, t, k, g, n, s, z, h, l, w, y, and ʼ, the latter two presumably representing /j/ and /ʔ/; while the four vowels consist of centered, open, closed front, and closed back, the specifics of pronunciation according to the speaker’s species. For convenience, these are transcribed as e, a, i, and u. Because all language-capable species are able to orally produce and recognize basic tonic distinctions, the language has two tones, high and low, the former transcribed with an acute accent. No two high-toned syllables can occur in succession, nor can high tone occur in the last syllable of a word. In order to reduce the possibility of vowel-reduction leading to undesired phonological evolution of the language, there is no syllabic stress. Speakers whose native language employs syllabic stress (and therefore have a hard time avoiding it), are advised to stress high-toned syllables or to stress the last syllable of a word, unless they are speakers of languages that normally stress low-tones syllables, in which case they are advised to stress the syllable following high-toned syllables. The morpho-syntax of the language is right-branching, except that subjects precede verbs. The grammatical typology is agglutinative, utilizing prefixes without any fusion or sandhi. The following examples illustrate some of the morpho-syntactical details, as well as the somewhat Polynesian-meets-Bantu-sounding phonology. Wanu hinuyúya yasili ‘ebílu ke bakísu tunáne ha’u wi. Wanu hi’iyile gika kusikéla buKasane ʼinaha ʼekusibagíwe. wanu hi-’iyile gika kusi-kéla bu-Kasane ʼi-naha ʼe-kusi-bagíwe. Kúnu ʼuhu ʼihini getu ʼatúhu gezesíga. 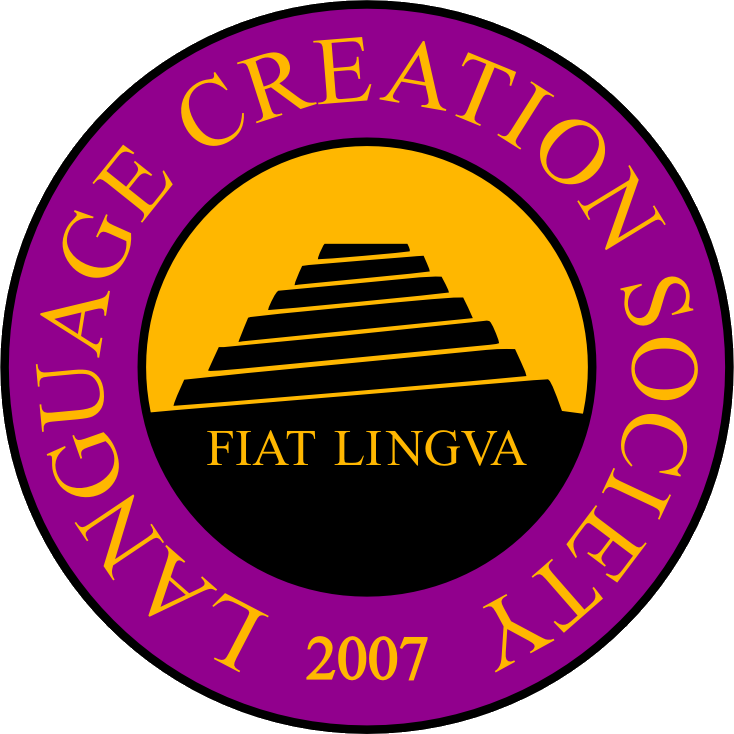 Fiat Lingua, an online archive of articles related to conlanging, is looking for submissions! Fiat Lingua publishes everything conlang-related, including reviews of conlang-relevant books, conlang grammars, essays on style, conlang criticism, scholarly work on a conlang-related topic, and conlang artwork and prose or poetic composition. If you have something you’d like to publish or have an idea you think might work as an article, email fiatlingua@nullconlang.org. All submissions must be in PDF format. Lexember is quickly approaching! December 1 kicks off the annual Lexember event, where participating conlangers create (and post) one new word per day throughout the entire month of December. For those posting on social media sites, you can use the hashtag #lexember so that other participants can more easily find you and your posts. You can read more details about it on the FrathWiki page. Happy conlanging! New Republic included an article about the rise of invented languages. LCS has access to YouTube’s Creator Spaces. See this page for details. If members are interested in using a professional video production site for something LCS-related, contact Sai. We need to submit details to Google for approval after we have a firm plan for how to use it.